Chapter seven of Daniel tells of four Beasts. These Beasts have to do with ruling and influencing the Jewish people. They are Gentile rulers and the terrible Beast of Daniel 7:7 is very strange, having ten horns. What does all this mean? Daniel wanted to know the interpretation of the vision and requested information from the angel in his vision (Daniel 7:15-16). He was told the Beasts represented kings or kingdoms. The fourth kingdom would have 10 horns, which were also kings or rulers (Daniel 7:20, 24). I believe most commentaries on the book of Daniel agree that this fourth kingdom is Rome. However, the interpretation of the ten horns vary, but most believe they are resurrections of the Roman Empire with the Roman Catholic Papacy as the little horn that makes it all possible. I don’t go along with this interpretation for various reasons, but mainly because the interpretation has in view that Roman Catholics, and especially the Papacy, are not Christian. I think this is a very presumptuous interpretation, categorically labeling Catholics as evil and non-Christian. It not only doesn’t fit the Scriptures, it is a very unloving way to speak of one’s brethren. I don’t mean to imply the evil that was done in the history of Roman Catholicism, e.g. the Inquisition, was done by Christians. It was not. Nevertheless, Peter had predicted that false teachers would arise and rule over the flock of God. If we can believe much of the evil done was lead and/or inspired by false teachers, then we should apply the rest of Peter’s prediction, namely, that these false teachers that had gained great political power ruled also over the flock of Christ, i.e. Christians. Jesus also predicted this, saying that the way of Christ would be put in damaging light through the scandalous behavior of such evil men—who were not his people. I will speak of the little horn with eyes and a mouth in a later blog. This part of the vision is comparable to the mouth of the Beast in Revelation 13. However, concerning the Beast and the ten horns, Revelation chapters 13 and 17 also have something to say that can supplement Daniel 7. What can we know of these men who ruled the Jews? Daniel says their dominion was taken from them but their lives were prolonged for awhile (Daniel 7:12). That is, in most cases the king was killed if replaced before died a natural death—not so concerning the procurators who ruled as kings in Judea. They went on living, some were banished or exiled, but none of them were killed. Festus did die in office, but this was a natural death. When we look at the book of Revelation in the New Testament we find many similarities with the book of Daniel 7, specifically in Revelation 13 and 17. Here we are shown a beast with 7 heads and upon one head is 10 horns. Both Daniel and Revelation claim that the ten horns are ten kings (Daniel 7:24; Revelation 17:12). Indeed the governors of Judea and Jerusalem were called proconsuls. The proconsul possessed the authority of imperium. What this means is: they were autonomous in their authority and could govern as they saw fit. They were under no obligation to consult higher authorities, including the emperor, before making decisions within their provincial command. The only condition was that the emperor received his taxes from the province and that the procurator was able enough to keep the peace and put down any insurrection that may develop. In all things he exercised the authority of a king. 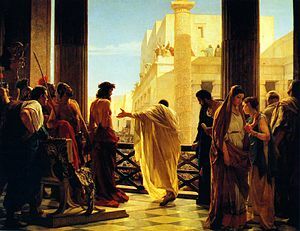 It all occurred in the 1st century CE before the Jewish war with Rome that destroyed Jerusalem and the Temple in 70 CE. There is absolutely no reason to look for 10 future kings to reign before the return of Jesus to this earth. “The governor, whether proconsul, propraetor, legate or prefect, wielded the power of Rome in his province. He was bound by the provincial charter to honor specific arrangements for tax exemption and other prerogatives, and the provincials could complain about his administration to the senate or emperor. Otherwise, his exercise of imperium was very nearly absolute. He made deals with the local authorities in the cities or tribes. He exercised police powers through his command of the legions, if any were stationed in the province, or more often through a smaller military unit made up of auxiliary troops composed of non-Roman citizens. He heard law cases and pronounced capital sentences…” THE GRECO-ROMAN WORLD OF THE NEW TESTAMENT by James S. Jeffers; Chapter 6 “Governing of the Provinces & Palestine” – page 114. Thank you for the healthy interaction of minds and proofing of spiritual understanding. I myself also find such quite edifying. Iron sharpens iron. Ironically, it takes roughness (imperfections and friction) on one iron to sharpen the edges of the other. Forgive me though, I think you’ve fallen to the pitfall you admitted in one of your responses to comments, which is the error of proving one’s point of view instead of God’s word. I however have no doubts that you are sincere in spite of this. Firstly, regarding the order of the ten horns, your submission is possible. I have not taken issue with you on that so far. My focus has been the order of the beasts. It is important to clarify that the issue we are thrashing is not what is possible but what is contextually indicated as having occurred. True, the vision of Daniel 2 showed the image at once but that probably because sighting it otherwise was immaterial to perceiving the order of the elements since this was permanently fixed. The divine choice of an upright human form was strategic. The image was not first in a series but the series in static form. So Daniel 2:39 saying “after” is not with respect to the image as a whole but with respect to the elements and took his cue from the form of the image. You most certainly cannot deny that the silver was “after” the gold when looking at the image as an upright human form. I dare say that had God presented the vision in the form of a ladder or multistorey building, the order would very likely have been reversed to respect these variant forms. So, once he identified Nebuchadnezzar as the head of gold, it is obvious that the silver that follows “after” the gold in arrangement would represent something “after” Nebuchadnezzar. So “after” in Daniel 2:39 still means nothing else but “after” just as in Daniel 7: 6 & 7. The “after” is clearly connected with the head of gold and it’s arrangement in relation to the other elements and not in relation to Daniel’s sighting of the elements. In the case of the beasts however, we have multiple items, each with different features. It is definitely POSSIBLE for God to show all the beasts to Daniel at once and then communicate order by their arrangement in his view or by some other means, no doubt. However, what is POSSIBLE is not what we are discussing but what Daniel himself has narrated. It is like someone arguing from the point that because it is POSSIBLE for God to create the heavens and earth at once so we should ignore the narrative of him taking days to do it, preferring rather to interpret the narrative of the days as a way God just chose to assign the elements of creation to days and not really a statement of literal order. We are seeking to determine from Daniel’s narrative of the vision whether he saw the beasts in sequence or at once. I say from the narrative he intimated that he saw them in sequence not at once. The above indicate sequence in his SEEING at the very least. It means before “this” he had not seen the third beast, until he looked. It also means that before “this” he had not seen the fourth beast. The key words for me are “I looked” and “I saw.” Remove them and I will drop my arguments. This reminds me of how Jehovah’s Witnesses argue that Jesus’ return will not be physical while boldly citing the angels’ words in Acts 1: 11. They argue that he would return quietly and imperceptible to the world but only to few of his disciples as quietly and as imperceptible to the world but visible to only a few of his disciples when he left because the angels said that “Jesus, who was taken up from you into heaven, will so come in like manner he went into heaven.” The error in that is that the angels were not that vague about the manner of his leaving that they were alluding to that would permit us interpreting the “manner” as Jehovah’s Witnesses choose. The angels specifically said “in the manner YOU SAW him.” So the physicality of his leaving in their sight was the manner the angels meant. Similarly, I particularly give precedence to Daniel’s explicit recalling of when he SAW the third and fourth beasts as indicative of sequence in his sighting them and by extension their rising from the sea into his view. And like Silver noted, he did not say something like “one beast was like this and another was like that.” He said ‘the first was…” And given that the fourth was his strong fascination among all, it would have been expected for him to observe and describe it first. But no, he described it as fourth, seen (I saw) after this (the third beast). In summary, I took you up on this issue in defense of Silver and my point is simple. His usage of “after” with the beasts is in relation to his “SEEING” of them not some arrangement of them. Moreover, the usage of “after” in Daniel 2:39 is particularly in the interpretation while here it is at both the level of the SEEING of the vision and the interpretation of the vision. If we would believe that “after” means “after” in the interpretation while would we think that after in the “seeing” is not “after”? The point is clear, you just don’t pick a meaning that suits your fancy but factors such as the form of the word must be considered in selecting the appropriate meaning in the range available.The original word we started out reviewing about actual has 6 forms under its entry. The reality is that word entries comprise not just of the base word but also related forms of it. So the range of meanings attached to an entry is not automatically true for the base word and every form of it. I don’t think it is healthy to be casting doubt on the work of translators just because you have a point of view that you must uphold at all cost. You would be guilty of trying to make the Scriptures say what you feel rather than trying to understand what the Scriptures is saying. Where an alternate meaning exists for a word in a particular context and it is significantly different from the first choice, translators usually indicate it. So you see, your proposition is not as straightforward as you might think. Context is very important as well as several other rules. The translators presumably meticulously considered context, usage, word order, idioms and other things before settling for the choice of “after” in the contexts and “place” in those other contexts. If you choose to reject the translation choice of “after” and suggest instead the translation “place” just because you found it in the semantic field of the Hebrew word and it favors your point of view, then any and every one can reject almost any word that has alternate unrelated meanings, preferring one over the translators choice just because it favors their point of view as well. Now regarding the matter of the little horn, permit me to set you straight again here. There are only two words inserted in the verse by KJV translators – “are” and “that.” These are to complete the grammar to the English reader. These words are italized to indicate this to readers. NASB successfully avoided any insertion by crafting their language to say the same thing without the need for these words, hence they have no italized word in the verse. The word “them” on the other hand is not an insertion, hence it is not italized. It is not derived from the word translated “after” even though in the interlinear it is placed beside it. It is rather derived from the word translated “shall be diverse.” The Strong’s Concordance’s Hebrew entry number is 8133. The “before” as used here does not mean “ahead of” or “prior to” as you would like it to mean, rather it means “at the emergence of” or “at the coming of.” This is not a passive humbling of their reigns’ achievements by his own achievements after succeeding them and reigning, but an active humbling of them by him ending their reigns in order for him to come up and even begin his reign at all. To further buttress this I refer you to Daniel 8:6&8. The second verse shows how God indicates succession within the same kingdom using horns still as symbols for kings. Again, it is not by one horn being “plucked up by the roots before” another but by a preceding horn being broken and one or more growing in place of it. In this vision, the four horns, representing Alexander the Great’s succeeding 4 Generals who were neither his descendants or near relative, “came up” (succeeded him) after his death (breaking of the horn) and effectively closed the possibility of any of his relative taking his place yet this is never portrayed as a “plucking out by the roots.” So we have the divine pattern there. Indeed, the word translated “subdue” could also mean “humble” but it is in the sense of “abasing” not in the sense of “overshadowing” or “dwarfing” as you are trying to suggest. The passage clearly portrays the little horn as the cause of the plucking and the interpreter explains it so. The language certainly evokes images of cruelty and extreme violence that is consistent with the descriptions of the little horn that in interpreting it the interpreter choose a word which could mean subdue or humble. The translators too must have inferred the same to prefer “subdue” over “humble.” Moreover, the other places where it is translated “humble” and it has to do with one party performing it towards another, the action is active not passive and the undertone is rough not soft. It speaks of God actively humbling in a forceful way (abasing) rather than him passively allowing someone’s efforts to better another’s and thus retrospectively humble the other’s. Your efforts to find what else the Hebrew word means and preferring the softer one found is just not fair to the context and the profile it gives us of the little horn. Rather, it’s pandering to your point of view. What I feel is that you are not willing to take the Scriptures own interpretation at face value, not because it is not acceptable and authoritative by itself, but because it conflicts with your determination of some other things. So you easily dismiss the face value, question its suitability among its alternative meanings or try to interpret it more favourably. I would rather think you will review your determination of those other things in the light of the Scriptures’ explicit interpretation, going on to build on the interpretation rather than trying to pick holes in it and water it down by needless and unproven technicalities so as to make it align with yours. I am inclined to think that this is not from insincerity on your part but because you feel you are not presently strong in your original arguments for arriving at your position and just don’t want to be bulldozed off it by my arguments. If I’m correct, pls don’t. Take your time to review your position whenever convenient for you. My points and others’ objections will wait for you when you are ready. My comments are not necessarily demanding immediate response. Finally, you seem to have missed responding to my point that the vision, and the interpretation given by the unidentified individual in it showed the judgement of the little horn as the divine act that concurrently brings to an end the dominion of both the horn and the beast while your interpretation does not. “The beast (Roman kingdom/empire) was slain, and its body destroyed and given to the burning flame” BECAUSE of the pompous words of the horn. The other beasts however had their lives prolonged only that their dominion was taken away. Your interpretation portrays the beast as continuing beyond the judgement of the little horn with 7 kings still coming up one after another over a period of 26 years beyond the horn’s judgement and the Roman empire continuing even for many more years after. So the little horn is now just an interlude rather than the final king in control of the beast. How do you answer this? The Lord bless you too. No need to be concerned about my feelings in this discussion. I take no offense. Concerning my error, if I analyze the Scriptures and interpret the word of God at Daniel 9:24 to mean all the things mentioned therein are fulfilled, then the 70 Weeks Prophecy **must** be fulfilled. Or, put another way, all the things mentioned in Daniel 9:25-27 **must** be fulfilled, and this is according to the word of God, because I studied Daniel 9:24 and concluded that all the things mentioned therein have occurred. Put in the context of our discussion, if Daniel’s Seventy Weeks Prophecy is fulfilled, wouldn’t that mean that all of Daniel 7 **must** be fulfilled, as well? And, if so, am I interpreting Daniel 7 to establish a preconceived idea or am I interpreting it according to the word of God? Concerning our discussion on the word “after” in Daniel 7, no matter what either of us believe about the Hebrew word, we arrive at the same destination: first in chronology is the Empire of Babylon, then Persia, then Greece and finally Rome. Personally, I don’t care whether one arose out of the sea first and the others followed one-by-one, or if they all appeared at once and Daniel described them one-by-one. As far as the interpretation of Daniel 7 is concerned, it doesn’t matter, one way or the other. The problem you and I have with Daniel 7 arose not with your challenge of my understanding nor with that of ‘Silver’. Silver’s challenge arose to defend another believer’s challenge: MrKnowYourBible. He tried to make the point that, if Daniel’s beasts arose one-by-one out of the sea, and each one was seen before the next one, then my understanding of the 10 horns occurring not at once but one after the other **must** be wrong. THEREFORE, I took a closer look at Daniel 7. I found that in Daniel 7:3 Daniel saw all four beasts at once, and this made his point moot. If Daniel saw all four beasts at once but described them in a chronological order, then the 10 horns can be understood in the same manner. You sought to make the point earlier that Daniel 7:3 is actually “…something like an executive summary before the details of a business document. It is similar to the narrative of creation in Genesis 1” However, your understanding falls, if Genesis 1 isn’t a similar narrative before creation. As I understand the creation story, God created everything in the universe in Genesis 1:1. However, it was without form and void, and darkness was on the face of the deep. That is, everything was there, but it had no order. It was literally chaos. The rest of Genesis 1 shows how God put all things in order. When I claimed it was “possible” for Daniel to see all the beasts together rather than one after the other in chronology, I meant that the Hebrew rendered it possible, not that we could look at it as a possible matter to consider (without evidence). We already have Daniel 7:3 saying Daniel saw all four beasts before he began to describe what he saw. You have an opinion about that, but, quite frankly, you haven’t proved your point. Moreover, we have in Daniel 2 the fact (and we both agree) that Daniel saw the entire image at once. Daniel’s image in Daniel 2 is the same but explained in different terms in Daniel 7. In Daniel 2 we have no trouble seeing the whole four Kingdoms at once and also understanding their chronological order. In Daniel 7 I have no reason to suppose differently. Daniel saw four beasts (Daniel 7:3). Whether he describes them left-to-right (Hebrew manner) or right-to-left (gentile manner) or the one closest to him first and the furthest last, the text doesn’t say. Nevertheless, we can assume Daniel knew how to describe the beasts and in what order they should be described. Concerning the word after, I must bow to your understanding as it pertains to how one translates one language into another and the various meanings that could be attached to a single word. I have no training in such things and am totally dependent upon the works of the scholars. That said, scholars often disagree about some matters, so interpretation in such cases rests upon the reader, as he is guides by the Holy Spirit. Nevertheless, every translation I own has “after” at Daniel 7:6 & 7. Yet, both the English word after and the Hebrew word ‘athar (H870) have double meanings, one concerning ‘time’ and the other concerning ‘place’. If ‘after’ at Daniel 7:6 & 7 means the one ‘behind’ the first (and second etc. ), it would still be accurate. One would have to actually see the vision Daniel saw in order to say one way or the other, because I don’t think the Hebrew has a ‘jot or tittle’ on the word to indicate time over place, but even those were added later to the Hebrew in order to help the reader understand. The Septuagint uses the Greek word opiso (G3694) for the Hebrew, H870, at Daniel 7:6 & 7. G3694 is used in Matthew 16:23 for Jesus telling Peter to get behind (G3694) him. It is used also at Luke 4:8 for Jesus telling Satan to do the same. It is used again in Luke 7:38 for the woman sitting ‘behind’ Jesus, wiping his feet with her hair. Frankly, I am at a loss to understand how one knows for certain what in the Greek or Hebrew would indicate time, especially when the English word the Greek and Hebrew translates to can be understood to indicate time or place. That said, and assuming there is no such thing in the Hebrew or Greek that **causes** the word in question to indicate time instead of place, I have to say: Daniel could very well be describing a third beast ‘behind’ the second and a fourth ‘behind’ the third, and this, as best as I can understand at the moment, is according to the language of the Bible. I may be interpreting against the normal reading, but I don’t believe my understanding is some strange thing that would be considered ‘reaching’ or ‘jumping thorough hoops’ in order to establish my own point-of-view. Now, concerning the little horn, you are correct about the word, “them”. It does come from the Hebrew (H8133) and not from the word, after (H311). I should have consulted my Hebrew Roots Bible, but working through it is very tedious for me. This is the way it translates: “(H1932) and he (H8133) them and he shall be diverse”. So, the placement of the word “them” in the translation itself is in error. The “them” doesn’t follow “after” but follows “diverse”. I can accept that rendering. “He shall be diverse—them and he,” or “He, them and he, shall be diverse,” or “He, he shall be diverse from them.” That makes sense, but “after them” (i.e. after the whole group of ten horns) does not, according to how I understand the chronology of events in Daniel. The after in Daniel 7:24, as much as I can see pertains to the three horns that are “subdued” or “humbled”. Even Daniel 7:8 connects the little horn with the first three horns of the ten, not necessarily the ten as a whole. Your statement: “This is by the authority of the person Daniel himself approached in the vision” is an opinion based upon: “The target word is thus derived as part of the paraphrase of the source word. This is what probably applies here” (emphasis mine). You’re assuming the “authority of the person of Daniel” through a paraphrase of the Hebrew, which probably applies to our argument. Admittedly, you are far superior to me when it comes to translating a language, but your own use of words concerning this point is based upon supposition. That said, I must go with my understanding, which is based upon an earlier study of Daniel 9, which demands that Daniel 7 must be fulfilled. Concerning subdued or humbled in Daniel 7:24, the text says the little horn made war with the saints. I makes no specific reference to it making war with anyone else. Anything like that would be interpreted by those who read the text. Did Agrippa make war with the saints? Yes, indeed he did, and the Apostles had to flee his kingdom in order to survive. Did he arise after three horns? According to my interpretation of who the horns are, yes, he did. Did the Jews love him and hate the procurators? Yes, they did. Might this have upset the Roman equestrian class, out of whom the procurators arose? Yes, it may have. Certainly, Josephus shows that the president of Syria wasn’t happy with Agrippa. Can the Hebrew (H8214) be used ‘softly’ rather than in a conquering manner? Yes, it can; both Daniel 5:22 and 4:37 seem to evidence a ‘softer’ humbling experience. Certainly, lives weren’t expected to be taken nor the men in question conquered by another. Concerning Daniel 7:8, notice that the text says the little horn came up “among” or “between” them, thus dividing the 10 into two groups of 7 and 3. That is, they are 7 and 3, because of the 3 singled out from the other 7. Concerning “before”, we’ll go with your interpretation: “at the emergence of” or “at the coming of” the little horn the three were “plucked up by their roots” (Daniel 7:8). According to Barnes Notes, it is concluded that “they were rooted out – as a tree is overturned by the roots,” and that is exactly what occurred. The Roman equestrian class no longer ruled Palestine, as long as Agrippa was alive. That such a thing had to be done violently is supposition, and the text doesn’t demand that it be done violently. Agrippa’s troops manned the Antonia. Roman troops were no longer present in Palestine for protection or to keep the peace. Agrippa was the ruler in the same manner as Herod the Great was ruler of the Jews. Your concern: “What I feel is that you are not willing to take the Scriptures own interpretation at face value…” On the contrary, I believe I have interpreted everything according to the Scriptures’ own interpretation. I take no Scripture alone (which is what we are doing here), but, rather, I compare each Scripture with other Scriptures that concern the same things, so that interpreting the one, I don’t contradict the other. Many of the Scriptures about which I write dovetail into other studies, and Daniel 7 is no different. However, my caution about changing what I’ve claimed in Daniel 7 is based upon my studies of God’s word elsewhere (as well as in Daniel 7). If I change one, I probably must change others, perhaps all others. I will not do that without just cause, and, thus far, I am not convinced by your point of view. I don’t mean that in a nasty way, but, no doubt, you are in the same boat I am, as far as Daniel 7 is concerned. I imagine you believe the 70 Weeks Prophecy remains to be fulfilled—at least the final week of years. If you would become convinced that Daniel 7 is fulfilled, then you must reconsider the 70 Weeks Prophecy etc. There is a domino-effect for both of us here. Our discussion has great private concerns for both of us, as far as how we view where we are and what lies ahead, Biblically speaking. Concerning what I missed in your previous comment, what “beast” is Daniel speaking of in 7:11? The 10 horns are called “beasts” in the next verse, so could the little horn also be called a ‘beast’? If not, why not? Certainly, Agrippa was destroyed in 44 AD, and his government was replaced by the Roman equestrian order once more. Moreover, concerning the judgment referred to in Daniel 7, is it the last judgment? There is nothing there in Daniel 7 that would lead us to believe this is the final judgment. In fact, 7:11-12 unfolds into the Messianic reign in 7:13-14. The question is, who is reigning today? Revelation 11:15 says when Jesus reigns the nations are angry that his time has come, but he reigns forever anyway. When does Jesus reign begin? I have it beginning in the first century AD. You seem to believe the little horn is the final king who controls the beast. I don’t see the text saying that. Daniel 7 is concerned only with the influence of gentile powers over Israel. Daniel’s vision of the four beasts, including all the horns connected with them have no meaning beyond that. Daniel 7 is not a study of when and how these kingdoms arose, but when they arose how they influenced God’s people. There is no mention of the rise of other kingdoms later, because the kingdoms of this world is given over to the saints—to influence them, even conquer them with the Gospel. Nevertheless, they will hate us, just as Jesus was hated. Lord bless you Boluwade and your beautiful family. As much as I respect your perspective on the interpretation of the ten kings and related vision items, I think it falls short of the fact stated in Rev. 17:12 about them. As at the communication of this information to the apostle by the angel, many, if not all, of the “kings” you interpret as being the fulfilment of this revelation had received power and fallen out of power. Since the angel, while interpreting the elements of the vision to John said they had not received power, it means that we must look to John’s future not his past for these ten kings. Greetings Boluwade, and thank you for reading my blog, and especially for taking the time to comment. I appreciate it whether or not folks agree with what I have written. In reality, the procurators of Rome ruled a kingdom that was not their own. They never really “owned” a kingdom, but they ruled as kings. Essentially, this is my argument, but is this really what the Greek tells us? I will be the first to admit that I am not a Greek scholar. I am greatly dependent upon their works. However, my studies have also shown me that scholars disagree among themselves, so even a great education isn’t enough. We all need God’s guidance in these matters. The Greek word translated “as yet”(KJV) “have not yet” (NASB) is oupo (G3768). It is usually used to indicate **time** but not always. Sometimes it is used to indicate **degree**. John 3:24 would be a very good example of the Greek being used to indicate time. On the other hand, how should we render its use in Hebrews 2:8? Is there still some things that must be place under Jesus’ authority? Or, have all things been put under Jesus, but it is we who have trouble **seeing** the truth of this fact? Is it a matter of Jesus’ authority or the degree of our faith? Matthew 28:18 seems to indicate that all authority has already been given Jesus, and it is we who have trouble understanding how that works out. If my understanding of this word is correct, we can now apply that understanding to Revelation 17:12. The procurators of Rome were neither kings, nor did they have a kingdom of their own to rule. Rather, as the text says, they “receive power **as** kings, one hour with the beast” (emphasis mine). I take this as a matter of degree rather than an indication of time. Of course, you must decide for yourself, how you understand the word, and that is how it should be. I am not your guide, the Holy Spirit is. I am merely publishing my understanding of these things for the consideration of others, who may, prayerfully, compare it with what they have been told and let the Holy Spirit lead them as it pleases him. Lord bless you, Boluwade, in all you do for him. Thank you for reading and for your encouraging words. Lord bless you, David, in your walk with Him. “According to verse-3 Daniel saw all four beasts at once. They presumably had some order implied in that one was a first and another a second, but verse-3 shows Daniel saw them all at once. Your opinion **presumes** what Daniel “should” have seen. All 10 horns seen at once **is** consistent with Daniel seeing all four empires all at once (v.3)”. So you actually did say it, right here in your post. Truthfully an order was not presumed or implied, as it clearly shows that a definite order was stated. Daniel is telling the story of his vision here, and someone is writing it down. He tells the listener four beast come out of the water, he does not say all at once. Then he starts to describe to the listener exactly what it is that he saw and how it happened, he starts that by definitely saying first I saw, then I saw after that I saw. Remember the word first means before all others. If he had seen them all at once there is no need to order them as they would have no order, and he certainly wouldn’t say one was before all the others. I read the little horn article but have not seen depicted in your work which three kings were plucked up by their roots. Can you show these three kings that were uprooted by the coming of the last king, as it would be an important detail in determining the identity of this little horn. Greetings Silver, and thank you again for reading and returning to continue discussing the word of God. (Dan 7:3) And four great beasts came up from the sea, diverse one from another. Technically, nothing in this verse implies order. But an order must be implied, because Daniel begins verse-4 with: “The first was like a lion…” and continues in succeeding verses with the second, third and then the fourth. Where, then does Daniel find his chronology? It could be according to your understanding, but then you must read into verse-3 that Daniel saw the beasts arise one-by-one. As anyone can see verse-3 claims nothing of the sort. If the beasts arose all at once, order would be implied by mentioning them right to left (Hebrew style) or left to right (gentile style), and one could arrive at the same conclusion you make when you **read into** verse-3 that the beasts arose one-by-one. So, the difference between you and me is that you are reading something into the text, but I am not. Aside from all this, order is implied when taking Daniel’s vision of the four empires in Daniel 2. A time sequence is given and it ends with the legs and feet. In this case the order is from head to toe. The head wasn’t revealed first and the toes last, but the whole appeared at once and the interpretation began at the head and ended with the toes. I am simple enough to believe this is exactly what occurred in Daniel 7 for that vision. You may believe as you wish, but the conclusions you arrive at are the same I conclude with, and, for what it is worth, I don’t add anything to the text, but you do. If I don’t have to add anything to the text, I follow that path as a rule. You may do as you wish. Concerning the “little horn” and the three “kings” that came before him, I apologize for not being explicit in my post, but you may find a more complete discussion in my post Herod Agrippa and Revelation 13. However, you really don’t have to read it if you don’t wish to. What I claim there is that Pilate, Marcellus and Marullus came before him. You may try to make a point out of “plucked up by the roots” but you would have to show that that means something more than their reigns ended before Agrippa’s began. Any ruler who ceases to reign is in a sense “plucked up by the roots” unless a son or near relative takes his place. Anyway, that’s my take. You may now present yours. Lord bless you in your study of his word. I think I should call your attention to the Scriptures pertaining to the beasts of Daniel for a review of your take on order or their rising from the sea, and also the matter of the little horn and the three “plucked up by the roots” before him. Firstly, Daniel 7:3 truly does not indicate order but further down his narrative Daniel indicates that they arose, or more accurately, he saw them, in order not at once thus making Daniel 7:2-3 somethimg like an executive summary before the details of a business document. It is similar to the narrative of creation in Genesis 1. The first verse is an executive summary preceding the details. God evidently did not create the heavens and the earth at once but in an ordered process. If they all arose from the sea at once I don’t think there will be any suddenness about the second beast’s appearance. Note that the interpretation of the three horns being “plucked out by the roots before the little horn” is that the little horn is another king that will arise after the ten kings, but who, in coming to power, SUBDUES three out of the ten kings he arose after. He does not subdue all the ten kings but just three of them. If we interpret the “plucked out by the roots” statement as you suggest above it will make a nonsense of the specificity of the vision and it’s interpretation. For in that sense, we could as well say that he plucked up the entire ten by the roots since they all ended their reigns before his began. By extension also, every of the ten kings (as interpreted by you) plucked up the preceding one by the roots as well. I’m sure you by now see the looseness this sense creates about the entire vision. If plucking out by the roots is to succeed another without being a descendant or relative then there is nothing unique again in the little horn’s succession. The truth however is that it is not just that he succeeds three kings but that he overthrows them. And in overthrowing them I think that would imply him assuming dominion over their combined territories rather than just taking over a relatively static territory vacated by 3 successive kings. Probably most damaging to your interpretation of the ten kings and the little horn is the fact that in Daniel, the little horn is clearly said to arise “after” the ten kings (Daniel 7:24) not with or in between them. Going by your interpretation, he arises after the first three and is judged by God before even the remaining seven kings arise. The judgement of the little horn was clearly portrayed as a closing divine act to end the reign of the beast and it’s horns. There is no allowance for 7 kings to arise after the judgement of the little horn and continue the dominion of the beast for sometime after the judgement of the little horn. Your interpretation of him as Agrippa may need to be reviewed in the light of these points of mine. Greetings Boluwade, and welcome once again. I do enjoy a good discussion in God’s word. Concerning the ten horns of Daniel (or Revelation for that matter) and whether or not seeing them all at once hinders their being taken chronologically or one at a time, the precedent has been set in Daniel’s vision of chapter two. I believe most scholars agree that Daniel had only one unique vision. All other visions complimented and explained that vision in greater and greater detail. I have no doubt that you would agree that Daniel saw the whole image at once, but explained it from head to toe as to chronology. Therefore, it is **possible** to interpret the 10 horns of Daniel 7 in the same manner, despite how we understand the order in which Daniel saw the beasts arise out of the water. Nevertheless, and—just for fun—let’s look at how the wording in Daniel 7 plays out. Concerning “suddenly” (NKJV) in Daniel 7:5, while it is true that surprise is intended, it doesn’t seem the surprise indicates its sudden appearance. The surprise is its appearance itself. The KJV, the NASB, ESV and the LXX all have “behold” and Young’s Literal Translation has “lo”. So, the argument over its ‘sudden’ appearance is moot, unless we wish to debate which is the best scholar, and nothing is gained in that sort of thing. Concerning “after this” or “after these things” in Daniel 7:6 & 7, admittedly, it can be just as you say, but it can also be seen as it is used in Daniel 2:39 where Daniel tells Nebuchadnezzar that “after” him another kingdom shall arise. Yet, the image itself was seen all at once, not the head, then the shoulders etc. A point might be made in that the Hebrew word translated “after” (H870) is used eight times in the Bible. In five of those times it is translated “place” (Ezra 5:15; 6:3, 5, 7; Daniel 2:35). So, I wonder (and I am not a Hebrew scholar) if the word in Daniel 7:6 & 7 could be translated “in place of this” in which case, the argument would again be moot, if the translator merely chose an English word that supported his understanding without putting a note in the margin to say it could be translated differently and offer another meaning. Moreover, the LXX uses the Greek word (G3694) to translate the Hebrew (H870) and often concerns “place” rather than “time”. For example, the Lord speaks of those who would come “after” him (follow him) in Matthew 10:38. Another example is found in Luke 4:8 where Jesus told Satan to get “behind” him. Again, this fits well in my interpretation. First of all, in the three translations I have that include Strongs numbers over each Hebrew word (KJV, NASB and WEBSTER), all agree that the word “them” is supplied by the translator. It is not in the Hebrew. Secondly, the word “after” (H311) is found only three times in the Bible, all in Daniel. The first two times (Daniel 2:29, 45) it is translated “hereafter”. It is translated “after” only at Daniel 7:24. So, my question is: would “hereafter” make sense in Daniel 7:24? I believe it does. Hereafter, in the sense of after the time of Daniel. The text continues, “he shall be diverse (or different) from the first”, which could mean all ten or the first three (cf. Daniel 7:8). Continuing, “he shall subdue three kings”, Brown-Driver-Briggs Hebrew Lexicon defines the Hebrew for “subdue” (H8214) as “to be or bring low, humble”. The fact is that most Jews loved King Agrippa, but hated the Roman procurators. At least as far as Brown-Driver-Briggs is concerned, I don’t see the meaning of subdue in the Hebrew word. However, I am able to see how the tenures of the three preceding proconsuls were humbled in comparison by Herod Agrippa’s reign. Again, I am not a Hebrew scholar, but, as far as I am able to understand the writings of Hebrew scholars, I have to conclude that my interpretation of the ‘little horn’ still fits what I find written in Daniel 7. Concerning “plucked up by their roots” in Daniel 7:8, all ten procurators from Jesus’ time until the war in 70 AD ruled over the same territory, except for the time of King Herod Agrippa (41 to 44 AD). I see “plucked up by their roots” to mean the territory that was given to Agrippa wasn’t theirs to rule. They were rooted out of Judea and Samaria and had no say in its everyday government. The territory was given back to the procurators after Agrippa’s death and remained theirs until the war. Can the above interpretation fit Daniel 7:8, 24? I believe it fits and cannot be disregarded without due process. Is it the **only** interpretation that fits? Probably not, but it is the only one that fits what I have to say about Daniel’s 70 Weeks Prophecy. I have it fulfilled in the first century AD, and if it is fulfilled, Daniel 7 **must** be fulfilled. In truth vs. 3 could be interpreted in two different ways. One way we can look at it is what you state the definition of vs.3 is, and that he saw all four beasts at the same time, though we can admit that it doesn’t distinctly say he saw them at the same time, but I’m sure one could assume that after reading that small sentence. Another way it can be looked at is what we are reading is going on after the vision took place. Daniel is relating the events of his vision, the first event he describes is, ” behold, the four winds of the heaven broke forth upon the great sea.” Now in order to set the stage for describing the second event, because he already is aware as to what happens next, He continues with,”And four great beasts came up from the sea, diverse one from another.” He say’s this because the vision is over and he knows how many beasts there are, and just states the total number right off the bat and not necessarily saying he saw all 4 simultaneously. Then goes into how he had seen these beasts coming out of the water. There is a way to determine without a doubt which one of these are a more accurate way of seeing verse 3. I think if we look carefully what was written we can clearly see that Daniel was setting the stage for event two of his vision by stating 4 beasts came out of the water, because he already knows there are 4 beasts in all. Then what follows in vs.4-7 is his description of what he saw concerning that event . I my self knowing what they all look like at once and assumed you knew from my previous statement that it meant that I saw all four at once, would probably state it something like this, one beast looked like this while another beast looked like that and then another like, you get my drift. However this is not how Daniel say’s he saw the event, here is why we can say in all honestly that in fact he did not see the beasts all at once. Why can I say that? Because I read exactly what he said in his description of what he saw that’s contained in vs. 4-7. If he had seen them all at once then he would have never used the word first in describing seeing the first beast in vs.4. In order for there to be a first at anything is to denote that it must come before another, that’s why they call it first, and if he had seen them all at once then how could he have labeled any as first? because the truth would be that there wasn’t a first one as they had all appeared together. Then in vs.5 the words,”And behold another beast, a second” are used. There cannot be anything titled the second if nothing actually preceded it such as a first. Daniel states that he looked at the first beast for at least a brief time as he watches it till its wings come off. Then after describing what he saw first as first is the word used in describing it, he states, “And behold another beast, a second” It gets apparent by by the terms he is using to describe this section of the vision that it is a definite that he is describing the procession of the events he saw, in the order that he saw them. Vs. 6 uses the words,” After this I beheld, and lo another”. Does not the words AFTER THIS denote that something had come before it? Does not the term after this I beheld mean after this I saw? And the word lo here is used in the manner of it’s definition,” look! see! (frequently used in Biblical expressions; now usually used as an expression of surprise in the phrase lo and behold. So basically Daniel is stating here, that AFTER he had seen something else he saw another. Vs. 7 Uses the term, ” After this I saw in the night visions, and behold a fourth beast” Once again the words AFTER THIS denotes that some thing proceeded it as it is AFTER THIS, meaning it came after what was before. So what does Daniel say was before this? He say’s he saw the third beast which he say’s he saw After he saw the second, beast, which he describes as seeing after he had described seeing the first beast. So we can see from vs. 4-7 Daniel is giving us the procession of the way he saw the event he stated as being four beast that came out of the water. In this procession that Daniel gives he clearly used the word first, and if he did see it first, then it would be impossible for the other beasts to be present at the time as then he could not state that he saw it first plain and simple. As well he could not have claimed to see a second one after, as the second would be obscured until the first appeared and passed, because the second defiantly follows AFTER the first. From vs 4-7 we can clearly see what Daniel saw and he also in perfectly clear language stated in which order he saw them in. There was the first that has to come before anything else, then he saw a second, after that it says he saw the third. After he states he saw the third he then states he saw the fourth. Seeing all the beasts at the same time would not require one to list one as first because they all appeared together meaning that not one of them could be claimed as being first. He would have then just described the event of seeing them all at once, such as one looked this way another looked that way and yet another. There could be no way he could have said he saw one before the other then, if this was actually the case. But yet that is exactly what he did, he states that he saw the first, then the second, and after that the third and after the third the fourth. So really your assumption on vs 3’s meaning that he saw all the beasts at one time, is incorrect. If it were correct he then would have went on with the details of how he saw them all at once. But what it clearly goes on to show is that he gives the details of seeing each individually one after the other, in a procession. Remember the word first means, “being before all others with respect to time, order, rank, importance, etc.” So if he describes seeing one first it would mean he had to see it before he saw all the others otherwise it is not first and could not use the term as such. End of story on that point. As for the horns, I would agree with the guy that says they are all there simultaneously this makes sense because it states,” there came up among them another horn, a little one, before which three of the first horns were plucked up by the roots”. Note the little horn came up among them, and while doing so three were plucked from the roots before him. Basically because of its arrival three where removed for what ever was the cause of their removal. Greetings and welcome to my blog. Thank you for reading and for your comment, although there seems to be a misunderstanding. So really your assumption on vs 3’s meaning that he saw all the beasts at one time, is incorrect. You used 14 paragraphs to refute something I never mentioned! Perhaps you had another blog (not mine) in mind? Whether Daniel saw the beasts chronologically or mentioned them from right to left (Hebrew style) or left to right (gentile style) is really of little importance, as far as I can see. The point was made in Daniel 2 that the empires would come one after the other in time sequence. Just about everything Daniel claims in later visions is an elaboration of his first vision. As far as the interpretation of the 10 horns is concerned, you are welcome to your understanding–you are in good company, and you embrace the predominant point of view. I don’t. I have gone on record and named each of the 10 “kings” and disclosed who the “little horn” might be. Anyone can deny my understanding, but few have actually tried to refute what I have claimed. I, therefore, stand in what I have come to believe what God revealed to me. If no one can actually show where I am wrong, then that seems to speak for itself. I hope that you are in good cheer! Notice in vs 7, Daniel saw all the horns all at once “it had 10 horns”. I would think that would suggest that these 10 horns or 10 kings (vs 24) will be ruling at at least in one instance simultaneously and not it succession. If it was in succession Daniel would have seen the first horn rise up, then the 2nd, then the 3rd and so on and so forth; to make it consistent with the way God revealed the beasts to him. Notice also the little horn that rose up (vs. 8), he plucked up 3 of the 10 horns (kings) by the root. This further reinforces the point that these kings will be in power when this little horn makes it appearance on the world stage, but 3 of them will be subdued. I would like to submit that the 10 horns cannot be studied apart from the little horn, in fact the reason why the 10 horns were mentioned was to identify the little horn, for it is the little horn that will make war with the saints and prevail against them (vs. 21). Greetings Mr. K-Y-B, and thank you for reading my blog and for taking the time to comment. I always enjoy a good discussion. You are correct in that we agree that these kingdoms came in succession, one after the other. You are certainly welcome to your opinion, but I believe the sense refers to the horns or kings/governors that arise out of fourth beast. According to verse-3 Daniel saw all four beasts at once. They presumably had some order implied in that one was a first and another a second, but verse-3 shows Daniel saw them all at once. Your opinion **presumes** what Daniel “should” have seen. All 10 horns seen at once **is** consistent with Daniel seeing all four empires all at once (v.3). Truly, verse-8 does say 3 of the 10 horns are “plucked” up, but it does not say by whom or even if it was through violence. All it says is they were plucked up by the roots—in other words, the little horn was not as the first three are/were. I have shown in my blog-post that there were 10 Roman governors of Judea from the time of Jesus until the destruction of Jerusalem. Everything that Daniel and the New Testament say about those years fit these governors and the Little Horn. You may agree or disagree with me, but the fact remains that everything that is said in Daniel and Revelation fits my conclusions. If these things point to another kingdom or another time—what kingdom and time would that be, and upon what **in Scripture** would you base your conclusions?